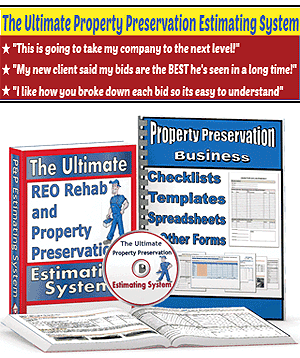 Contractor Estimate Pro is a piece of software that was created by a contractor who has sold over $22 million dollars worth of jobs in his career. He designed this software for estimating and invoicing his jobs and for keeping track of his customers. This is the estimating software I use for my company. 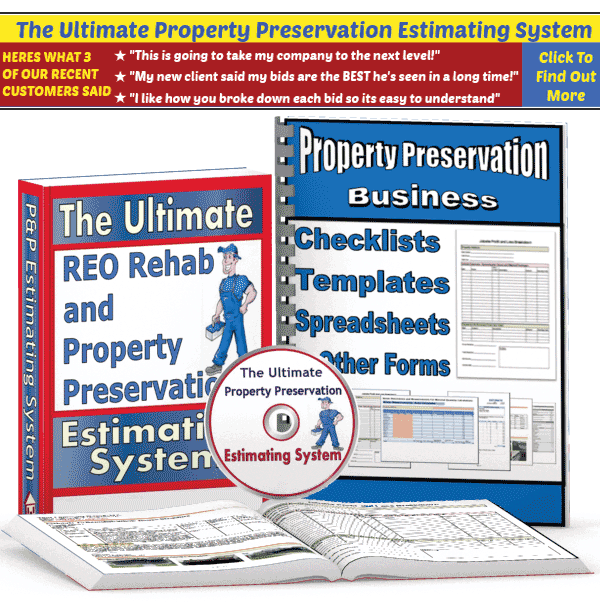 I’m pretty sure other Property Preservation business owners would also find this software beneficial to their businesses for a number of reasons. First of all, it is being sold for a 1-time charge of $99.95, which is the lowest price of any other similar estimating software products currently available. Most of the estimating software products with similar features that I have tested over the years were charging a recurring monthly fee to use their products. I prefer buying my software outright. Secondly, this one has several additional features and capabilities that the other similarly-priced estimating software products do not. Plus the Contractor Estimate Pro interface is quite intuitive and user friendly. I would be willing to create a future blog post showing exactly how I use this software for my operation, if enough people show interest in such an article. You can watch a short video about Contractor Estimate Pro at the software developer’s website, where you can see all of the various features included in this piece of software. Thanks I’m going to check this out!